We recently were the benefactors of a very generous grant from the Jewish Community Foundation Los Angeles (a massive post on this is in the works). Thanks to their generosity, we have been able to expand the offerings of Jewlicious in Los Angeles, including this past August’s Camp Jewlicious. This month Jewlicious is launching TIKKUNFEST, a day of community service and social action culminating in a free concert for volunteers. Volunteers will spread out over 18 blocks of Pico Blvd. – aka The Chood – planting fruit trees and herb gardens in custom made planters, painting stuff, cleaning up garbage, repairing stuff, collecting clothing and food for the needy at registration, assisting seniors with stuff, a few other projects and promoting community involvement. 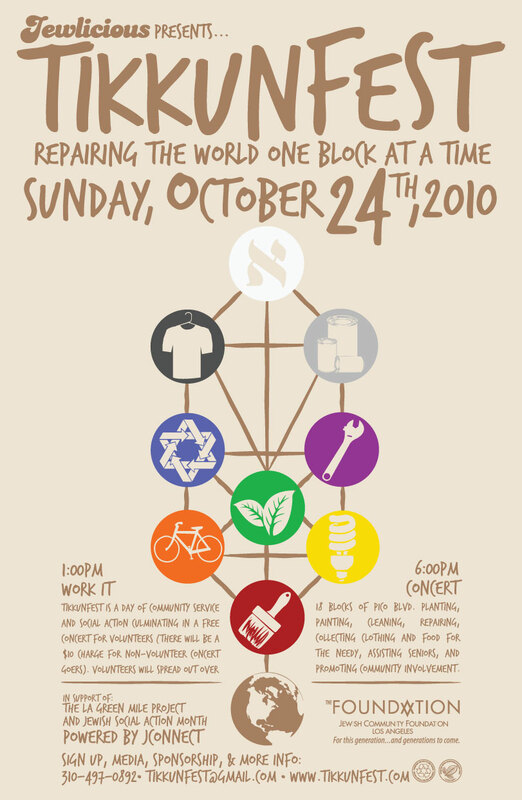 TIKKUNFEST is in support of Jewish Social Action Month and The LA Green Mile. The LA Green Mile began a few years ago to help clean up the section of Pico Blvd that runs through the most thriving part of Jewish LA. You can also be a contributor by sponsoring a planter, or supplies, the concert, and the food. You can dedicate a tree or herb garden in honor or memory of someone and we will be putting plaques on the planters, and all sponsorships and donations are tax-deductible! Hope to see you on October 24th!